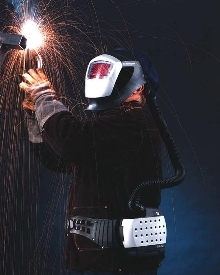 Welding Helmet provides clean, filtered air. SpeedglasÂ® welding helmet has AdfloÂ® powered air-purifying respirator. High efficiency particle filter can be stacked onto optional cartridge filter for additional protection against organic, sulfur dioxide, chlorine, and hydrogen chloride fume vapors. Systems are available with Speedglas 9000 auto-darkening welding lenses. All helmets and lenses meet ANSI Z87.1 standard for eye and face protection. Respirator approval is NIOSH 42 CFR 84. The new Speedglas® with Adflo® powered air-purifying respirator creates a positive atmosphere of filtered air within the helmet that is 25 times cleaner than the air outside of the helmet. - A "stackable" filter configuration: the system is always used with a High Efficiency (HE) particle filter; the HE filter can be "stacked" onto an optional Adflo cartridge filter for additional protection against organic, sulfur dioxide, chlorine, and hydrogen chloride fume vapors. In effect, it's two systems in one, allowing increased user flexibility to adapt to changing welding applications. The user can selectively replace either the HE particle filter or the Adflo OV/SD/CL/CH cartridge as needed; both filters do not have to be changed at the same time. No tools are needed to remove and replace any of the system's user-serviceable parts. - A lightweight, slim, all-in-one design that eliminates external batteries and battery cables, enabling welders to enter tight spaces. - "Smart" electronics to provide a nominal minimum airflow of 6+ cfm (170+ lpm) at all times, regardless of the battery's charge or the particle-loading of the filter. Audible and LED alarms signal low airflow and low battery charge. - The unique belt design has a solid leather front, cut narrow to allow the welder to bend forward easily. Along the welder's sides, the leather becomes wider, with large holes for maximum ventilation. The turbo unit securely attaches to, and is nestled between, the two plastic arms of the belt so the turbo's weight is evenly distributed across the entire lower back and upper hips. The plastic arms are vertically rigid but with pleats so the welder can move and turn with freedom. - A unique brushless motor with three times the design life of traditional motors. The environmentally-friendly NiMH battery provides 12 to 13 hours of operation per charge in the HE configuration and 5.5 to 6 hours of operation per charge in the HE + OV/SD/CL/HC configuration. The system comes with a smart battery charger that can be plugged-in without danger of overcharging. The charger controls the charging process automatically; batteries are typically charged in 3 hours or less. The Adflo Turbo filter cover holds and protects the HE particle filter, as well as a spark arrestor and a particle pre-filter that extends the life of the HE filter. The blower's breathing tube port is parallel to the welder's back, so the breathing tube tends to stay closer to the user's body and is less likely to loop outward, where it might catch on surrounding obstacles.